This article is about the geographical region. For the cultural-political area, see Nibenay. The Nibenay Basin consists primarily of the eastern side of the valley of the Niben, and its tributaries. It's mostly an open, agricultural area where the Nibenese Imperials hail from. 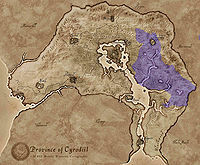 The regions of the Nibenay Valley and the Heartlands are sometimes considered as an extension of the Nibenay Basin area, with the Imperial City being located on an island at the head of the valley. 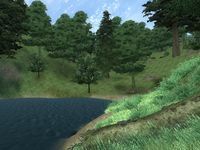 Beyond the Cheydinhal foothills at the eastern end of the basin, the Valus Mountains form the border with the province of Morrowind. To the south, the Panther River marks the border with Blackwood. As the drainage basin of the Niben, a number of tributaries and solitary lakes can be found in the region. These include the Reed, Corbolo and Silverfish rivers, and the lakes Arrius, Poppad and Canulus. This page was last modified on 7 October 2018, at 19:11.